Welcome to Mileage-Log.com. We've got lots of information and a number of resources here to help you log and document your business mileage, medical mileage, and charity mileage in a record keeping manner that will allow you to take advantage of IRS mileage deductions for your car or truck. Mileage tracking can be done using mileage log books. There are also now fairly inexpensive plug-in GPS devices available. Simply plug these into a 12 volt power supply in your vehicle. Some also require that you plug them into your vehicle's OBD (on-board diagnostics) connection. Downloading data from these involves either connecting the devices to your computer, or in the case of those with built in cell phone modems, downloading data from an online mileage logging service over the internet. Some resources, like our printable mileage log form, are free for you to print from our website. 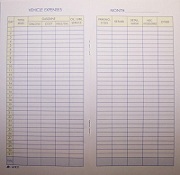 We also have a Vehicle Mileage Log Book for only $2.99. Click on the image at right to read more about it. Copyright © 2006-2016 http://www.mileage-log.com and Spectrum Research, Inc., All Rights Reserved.